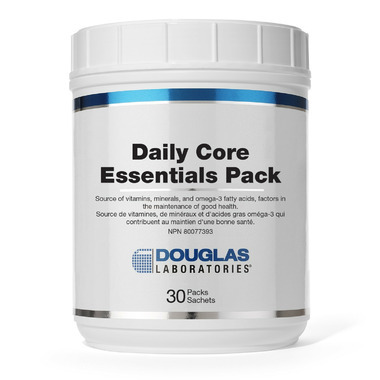 Douglas Laboratories' Daily Core Essentials Pack ensures you are receiving an excellent nutritional foundation, delivered in a convenient pack that can be easily carried in a pocket. This not only eliminates the clutter of bottles and dose confusion, but helps encourage compliance of use. It has been recommended that everyone take a multivitamin-mineral to ensure adequate intake of daily nutrients. Daily Core Essentials includes one of the most respected multivitamins on the market, Ultra Preventative X. Current recommendations by Canada's Food Guide are to strive for 7-10 daily servings of fruits and vegetables. UPX includes an organic green food base that incorporates over 25 different types of phytonutrients from fruits, vegetables and herbs, along with the key vitamins/minerals the body requires. Essential fatty acids are key nutrients that are lacking in the North American diet. Omega-3 fatty acids, including EPA and DHA, are essential fats that play important roles in cardiovascular and cognitive health. Opti-EPA incorporates 500 mg of omega-3 fatty acids and is enteric coated to reduce any fish aftertaste. Calcium is a mineral that plays numerous significant roles in the body. The majority of people do not reach their recommended daily intake of calcium. Cal-6+ Mg provides an optimal ratio of ionized calcium and magnesium in a highly soluble form, along with Vitamin D.
Coenzyme Q10 with Lipoic Acid offers excellent antioxidants for the maintenance of good health. Adequate antioxidant levels are required to quench harmful free radicals in the body.